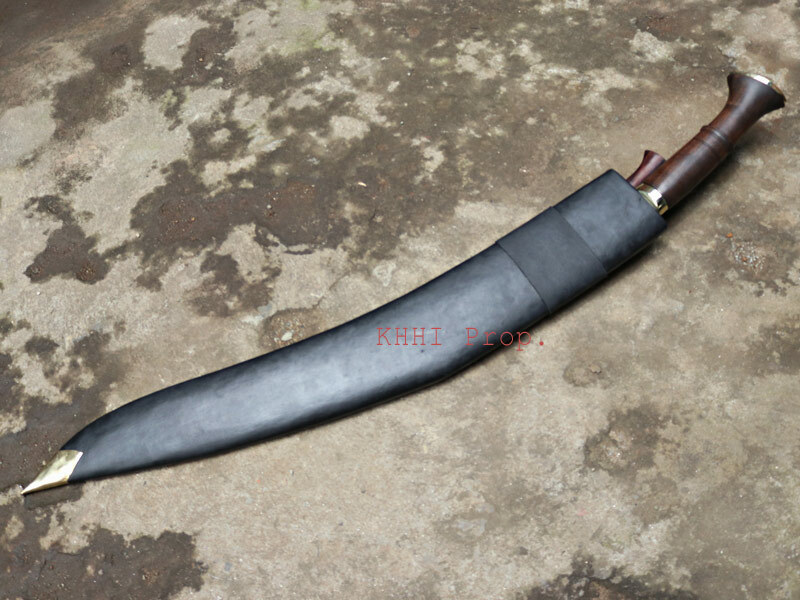 This is the largest kukri knife made by KHHI and probably in the whole world.. 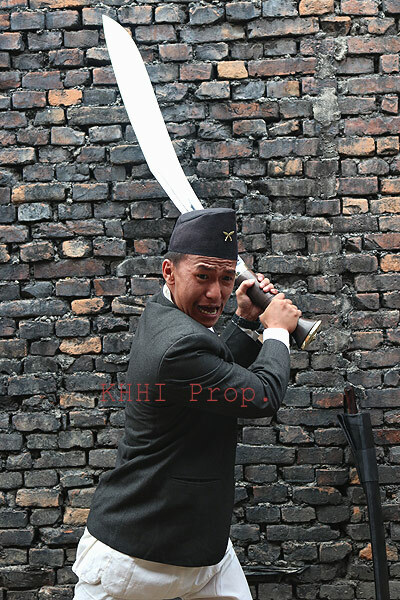 This is the largest knife made by Khukuri House Handicraft Industry (KHHI) and probably in the whole world. The blade is extraordinarily long measuring about 4 feet, a staggering 36 inches that is occasionally used for slaughtering very big buffaloes during festivals and sacrificial ceremonies and hence named as "Buff Head" or Buffaloes’ Head. In "Maar", one of the religious days of Dashain (Nepalese main festival), domestic animals are sacrificed after all the necessary rituals are undertaken. It is a customary (tradition) in Nepal that families celebrate the festival by sacrificing domestic animals (mainly goats, buffaloes and chickens) at home or mostly at temples as an offering to the goddess “Durgamata”. This is where the Buff Head comes into practice sometimes when huge buffaloes are to be beheaded. It is also important to mention that the beheading has to be done in one single blow otherwise the failure to do so would bring ill-fortune to the whole community witnessing the ceremony. It is a belief that still goes strong and must be achieved at any cost. 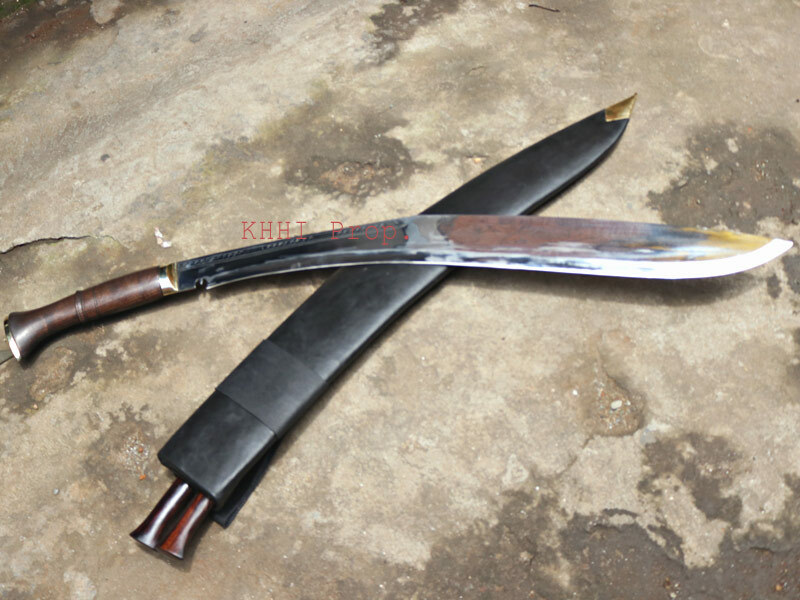 The enormous size is the strength and attraction of the khukuri. The size demands attention of the observers and at the same time demands skill and effort for the makers. The Buff Head becomes the centre of attraction in an ambient where as becomes a painstaking job to accomplish when making. It is the extreme labor needed and time invested that contributes to the high cost of the khukuri as everything has be done by hand with just simple utility tools. It takes almost 5 days for three skilled craftsmen to get a Buff Head ready working round the clock. The very work of forging 2-3 steels into one huge single size is one of the challenges of crafting Buff Head, let along other preparations. The gigantic size of the Buff Head is the strength and weakness to be precise. Strength, because it demands attention, the scary size appeals an eye for at least a glance; a perfect displayer to amaze. Weakness, because huge size of the knife makes almost impossible to use for the very reason it was made for. Hence Buff Head is more a display item than using even though it can be used when needed. Historically speaking it has always found near and dear space at big guns dwellings, to reflect status and power. This religious khukuri has always held a special place in the hearts of people of all races and walks of life. Buff Head kukri , the hardest to craft because of its sheer weight which weighs a hefty 4.5 kilos (10 lbs). 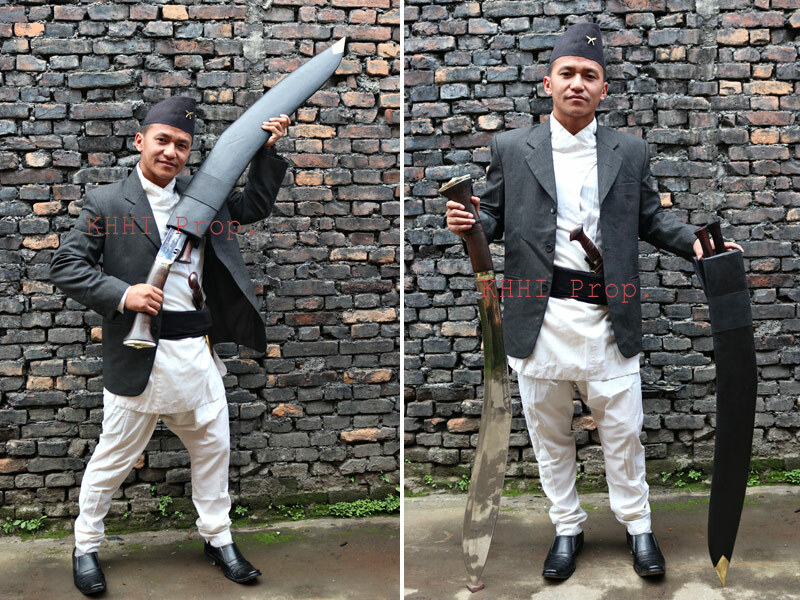 It is basically a normal khukuri like the famous “BhojPuire” if not for the size. Biswakarmas or the "Born Kukri Makers" only make the Buff Head. 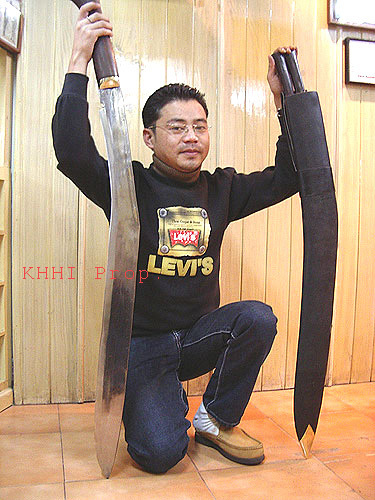 Two accompanying knives of the khukuri alone stand almost 8-10 inches (blade). It is therefore a complete full-sized knife that can be used like a knife independently. 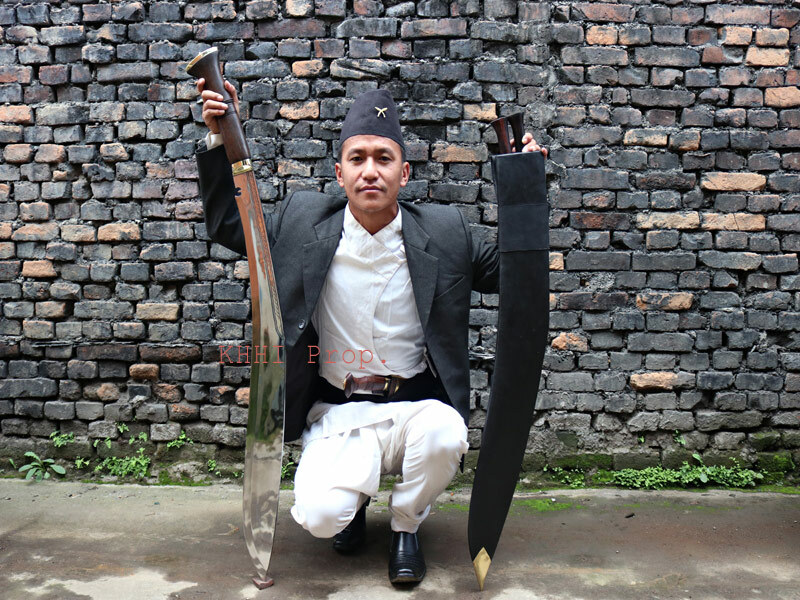 'BUFF HEAD' is the largest/ longest khukuri (kukri knife) in the world commercially available for sale at the khukuri house , KHHI, Nepal. based on this you can order a customized version of the largest kukri. Below is the video showing the making process yet another world longest kukri. This kukri was designed and made on custom order. This customized kukri is 7 ft / 84 inch, the largest kukri/khukuri in the world. It has 60 inch long balde and 20 inch long wooden handle. It is nicked as MOTHER of all khukuris. Wow! Better than I imagined. Thank you, Sir & thank all your craftsman that worked on the project. Thank you! Sincerely 1 extremely happy customer.